This active 8-day South Africa golf holiday takes you to some of the country’s best courses including the Pearl Valley Golf Course and Arabella Golf Course. Tour Cape Town extensively, relax at Sun City and go on safaris to spot the Big Five as well. Start your holiday with an exciting city tour of Cape Town. Visit the vibrant Victoria & Albert Waterfront in the evening. Stay at the Southern Sun Waterfront. Southern Sun Waterfront Cape Town, situated in the heart of the city’s most sought-after areas, offers postcard views of the Victoria & Albert harbour and Signal Hill. Enjoy a unique dining experience at Yizani Restaurant, work out at the fully equipped fitness centre, cool down at the outdoor pool, and indulge in decadent cocktails and fine wines at the hotel bar. 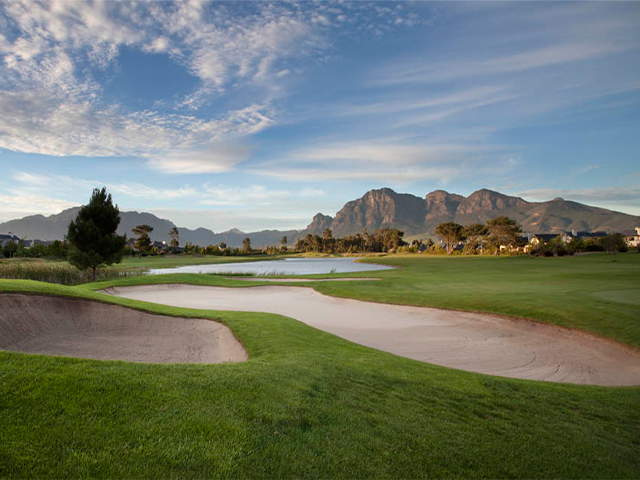 Enjoy a round of golf at the Pearl Valley Golf Course shaped by golf legend, Jack Nicklaus. Pearl Valley has two signature holes, 13th and 4th, both offering majestic views of the surrounding mountains and lakes. The 13th hole is a daunting par 3. As the water cuts from the right and a greenside bunker waits, one is mesmerised by the cautious tee shot. The 4th hole is as challenging, with limited margin for error as you need to cross the creek three times en route to a tricky green. This par 5 is regularly listed as one of the best par 5’s in South Africa, epitomising the ideals of risk and reward. 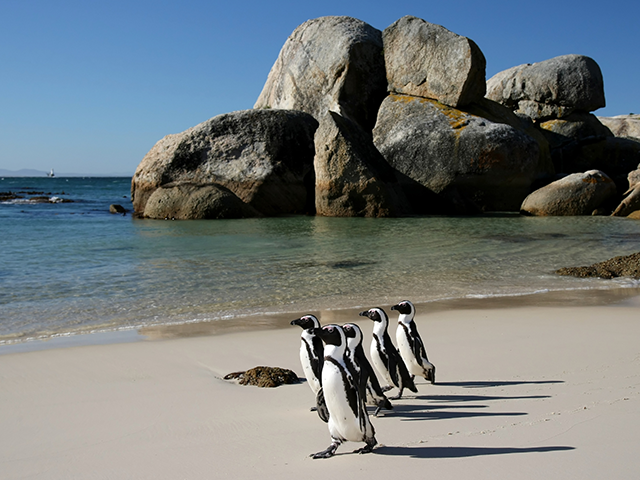 Experience a private full day tour of the Cape Peninsula. See fur seals on a cruise to seal island, drive through Cape of Good Hope Nature Reserve, visit Cape Point, and see penguins at Boulders Beach. Play a round of golf at the Arabella Golf Course, a beautiful private golf estate, surrounded by the scenic Kogelberg Mountains. The golf course staggers along the Bot River Lagoon, with incredible views of Arabella’s own gardens, manicured lawns and sculpted botanical life. The Arabella golf estate is ranked as the fourth best golfing experience by a top rated golfing magazine. The golf course itself is an 18-hole, Par 72 championship masterpiece. The 18th hole has been voted the best finishing hole in South Africa. Fly to Sun City resort and relax at the Sun City Hotel. Sun City is South Africa’s premier resort allowing you to indulge in golf, game viewing, and gambling. The Sun City Hotel offers stylish accommodation with a relaxed and casual vibe. The hotel overlooks the glittering swimming pool and the sprawling Gary Player Golf Course. Sun City Hotel offers an astounding variety of dining venues from traditional Indian and Asian flavours to poolside snacks and everything in between. The hotel complex houses the Sun City Casino as well as the Sun City Theatre. Enjoy a round of golf at the Gary Player Golf Course, home to the prestigious Nedbank Golf Challenge. Alternatively, choose to play at the Lost City Golf Course amidst Nile crocodiles! One of South Africa’s most famous golf courses, the Gary Player Golf Course, features 18-holes with a par of 72. Home to the prestigious Nedbank Golf Challenge, this course features a clever design, and its multiple tees make it equally enjoyable for the keen novice and the skilled professional. The course offers lightning fast putting surfaces, constant changes in elevation, and challenging water hazards that will thoroughly examine every aspect of your game. Imagine playing at an 18-hole, Par 72, desert-style golf course surrounded by spectacular views across South Africa’s wilderness—this is what you experience at the Lost City Golf Course. The 13th hole features a water hazard full of live Nile crocodiles, making this one of the most exciting golf courses in the world! The Lost City Golf course features multiple tees to suit every level skill while still providing a challenging round. The course spans a number of genres, while mostly desert-themed there are spots that feature mountain and parkland areas. 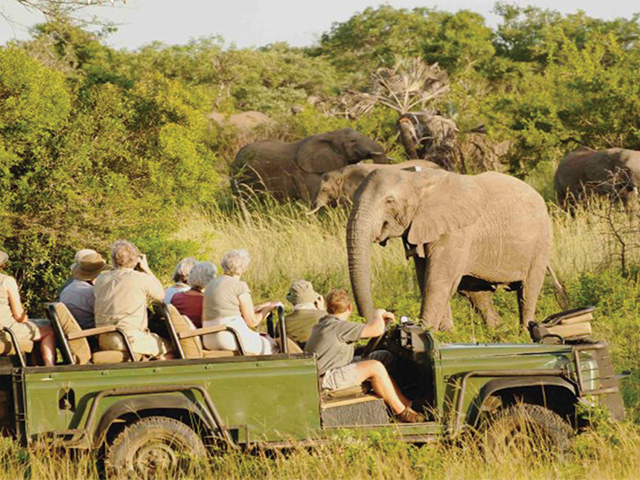 Go on an afternoon safari into Pilanesberg National Park to look for the Big Five. Stay at Kwa Maritane Bush Lodge. Kwa Maritane offers guests all the amenities of a prime resort within Pilanesberg National Park. The rooms here are luxuriously furnished and carefully designed. Overlooking the waterhole, there is the Kwa Maritane Restaurant where you can enjoy your meals. Go on a game drive with experienced guides, rejuvenate at the spa, choose between to inviting pools for a swim, play tennis to stay active, or simply unwind at the bar at Kwa Maritane.